Anti Nitriding Liquid offered is used in mixing process with Anti Nitriding Compounds and helps in enhancing work efficiency as well as enhancing product’s flow rate through maintaining smooth and even application of the mixture. The Anti Nitriding liquid supports selective gas nitriding, bringing down reduction in ammonia gas consumption and allowing use of stainless steel fixtures in place of inconel fixtures. The product is made available in HDPE container packaging of 5 liters and has shelf life of 12 months in factory sealed condition. SPS has expanded its business in the manufacture of Anti Nitriding Liquid. The application process starts when then been mixed with Anti Nitriding Compounds where as the proper mixing ensures the efficiency. After mix it should be hoed up to a long duration to get maximum amount of result in the operation. Their work efficiency depends upon the mixing period and ratio according to the need. Beside that this chemical is also enhancing the product flow rate by offering extra smoothness. 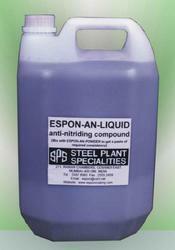 Looking for Anti Nitriding Liquid ?